Peter: So I was sitting in my cubicle today, and I realized, ever since I started working, every single day of my life has been worse than the day before it. So that means that every single day that you see me, that's on the worst day of my life. Therapist: Wow, that's messed up! I can't imagine ever holding a more depressing, demeaning job than the one I have now (which is, incidentally, the "assistant night manager" at a franchise of a popular chain of submarine sandwich restaurants). I realize I'm probably slipping into hyperbole (and I can think of jobs far worse), but humor me as the coddled child of a middle class family in a small town. I sit now, hunched over my keyboard, plunking out this review through gritted teeth and the pungent peppermint scent of BenGay, necessary due to unruly back pain, no doubt brought on by A) standing for eight hours in shoes I bought at Target, and B) doing all the menial tasks the useless people I work with refuse to do. But it's all worth it when I think that I am busting my hump (not that I have a hump, dromedary not being a major part of my genetic makeup) not only for the good of the company, but for a motivating $7 (!) an hour. Yeah, yeah, yeah. Whine, whine, whine. Why, you ask, have I regaled you with the no doubt enthralling, tantalizing story of my summer job? Simply to convince you that Office Space, the 1999 box office underachiever, directed by Beavis and Butthead creator Mike Judge, will appeal not only to those who suffer daily in the confines of a cubicle, but anyone forced to work as a faceless, interchangeable cog in a degrading job full of meaningless, repetitive tasks. Wow. Look how bitter I am. At 20! This doesn't bode well. Michael: Hey, what's this I hear about you having problems with your TPS reports? Samir: Yeah, didn't you get that memo? Peter Gibbons (Livingston) is a faceless drone at the software corporation Inatech. His talents are underused and his body overworked at a mindless programming job, and his time is constantly wasted as he answers to seven different bosses, each more cloying than the last. He hates his job, he hates his life, and his one wish is to just do nothing. His friends Samir (Naidu) and Michael (Herman), are likewise discouraged, but both fear unemployment more than anything else. When Peter submits to a session with an occupational hyponotherapist, a mishap leaves him under the influence and carefree about his job. He starts showing up late (or not at all), gutting fish at his desk, and ignoring his condescending, monotone boss, Bill "Hey, what's happening?" Lumberg. Not only does he not get fired for his shenanigans, he is promoted ("He's just a straight shooter with upper management written all over him. "), and his friends are sacked. Then Peter hatches a plan to put himself, Samir, and Michael out of work (and on easy street) for good. What's breaking the law if you do it ripping off a "soulless corporation"? Peter: I don't like my job and I don't think I'll go anymore. Peter: I don't know. But I really don't like it and, uh, I'm not gonna go. Office Space is smartly directed by Judge, working from his own script. There is a lot of sharp, snappy dialogue, much of it playing very close to Dilbert, but all of it nevertheless very funny. This is an incessantly quotable movie, like This Is Spinal Tap or The Princess Bride—don't make the mistake of mentioning it around a group of fans. Everything is underplayed, and the humor emerges more with each viewing. It's tongue-in-cheek without being too clever or sarcastic, and the end result is actually dimly inspiring, at least in the sense that perhaps everyone does have a proper place in the world. The direction is stylish, with inventive dream sequences and several quite effective "ghetto movie" parodies, complete with dramatic slo-mo, all set to thumping, explicit rap music. The cast of characters is the real bright spot, however, and the actors all are pitch perfect. Livingston is appropriately deadpan. His style may take some getting used to, but his excellent comedic timing will work its magic sooner or later. Herman is a standout as Michael, especially in his rants about his unfortunate surname (Bolton), and Naidu, while a bit underused, gets in some zingers as the token foreigner. Gary Cole gives a wonderfully irritating turn as Peter's boss; John C. McGinley is a self-satisfied consultant (and "a Michael Bolton fan"). Jennifer Aniston stands around looking pretty as Peter's girlfriend. My favorite, however, is Stephen Root as the mumbling Milton (the character that starred in the SNL sketches on which this film is based). His timid, semi-psychotic wallflower steals the film (literally, in one sense) with his mutterings. Milton: I believe you have my stapler? Office Space isn't perfect. Like another workplace comedy, Nine to Five, it looses steam in the third act when it shifts from sharp satire to a more traditional heist. Still, the film is knowingly derivative, as Michael cops to the fact that their plan to rip off the company "was in Superman III", and it never stops being funny. I'd love to go in to work tomorrow and pour gasoline all over those metaphorical bridges, but I need the money. So I just pop in this DVD again. Call it 90 minutes of wish fulfillment. Lawrence: What would you do if you had a million dollars? Peter: Nothing. I'd relax, sit on my a** all day, I would do nothing. Lawrence: Well you don't need a million dollars to do nothing, man. Just take a look at my cousin, he's broke, don't do s***. Image Transfer Review: This disc may not be anamorphic, but there is little else wrong with it. Neither edge-enhancement nor digital artifacting are evident at all, giving the picture a more natural, film-like look. The colors are excellent, with no bleeding or oversaturation. Film grain isn't a problem, and the print used for the master was in excellent condition. Fine detail is clear, with just a few scenes looking a tad soft. The only negative area is the black level. It looks good, but certain night scenes look a bit muddy, with questionable shadow detail. Still, this is a very fine looking DVD. Audio Transfer Review: This track is a bit better than the average comedy track. Of course, most everything is still confined to the front speakers, but the surrounds are quite active in several key sequences. The front soundstage is very wide, and there are quite a few directional effects to expand the soundfield in the mains. The dialogue and other audio elements are well-mixed, with the dialogue always sounding clear and natural. During the scenes that feature rap, the surrounds provide support for the music quite well. In addition, the two "action" scenes feature a bit of reserved surround use. Extras Review: This release of Office Space features nary an extra, save the trailer and a useless menu option, "Cast," which features a list of the actors in the film. Useful! Fox has indicated that a special edition is in the planning stages, but there's no telling when it will show up or what added-value materials will be present. 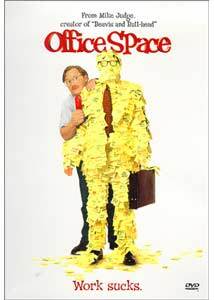 Office Space went unnoticed in the theater, but has already amassed a cult following on video and DVD. Once you see it, you will be quoting it at the office, I guarantee. Recommended to anyone who hates his or her job. So, pretty much everyone.